The Marché d'Aligre is a favorite among Parisians, so much so that it has almost a cult following of loyal shoppers. Despite its renown and reputation, I never really got what it was that charmed people so much about this market. Since I judge markets mainly on the amount of farmers present- of which Marché d'Aligre has none-it seems normal that this market never made it into my list of favorites. Still, with so many friends and food writers singing the praises of this celebrated market in the 12th arrondissement, I couldn't help but think that I was missing out on something. Inspired to understand the lure of Marché d'Aligre, I asked my friend Terresa to make me on a tour of the market, which is in her neighborhood and also a spot she knows quite well, often taking students there to stock up for the vegetarian cooking classes she gives in her home. Teresa graciously accepted to be my guide, and we started our visits with warm croissants devoured on the doorstep of the covered market. These delicious croissants from a nearby bakery were to be the first of many snacks involved in our grazing tour of both the covered and open air market, along with the lovely shops lining the Place d'Aligre. Once inside the Marché Couvert Beauvau we were offered spoonfuls of olive oil at the organic and artisanal ingredients shop Sur les Quais and then moved on to lemon tarts at the market's newest addition, a charming bakery called Jojo & co.
After chatting with the friendly vendor at the specialty Italian stand, it occurred to me that the success of a market isn't necessarily based on the sum of its producers, but also depends on the commitment of vendors to curating quality products. We then wandered the outdoor market which vies for space with an all-day, everyday, flea market on the square. Terresa agreed that not much of the produce here is worth buying- although there is one vendor that she trusts- Gilles Flahaut, who brings excellent seasonal produce, mostly from France, to the market. 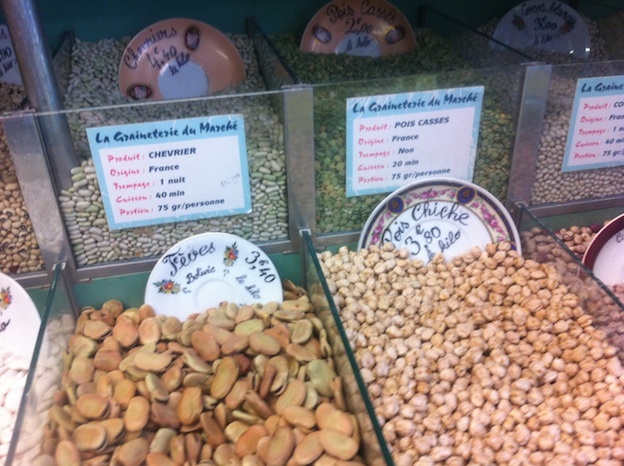 And then we came to my new favorite Paris shop- La Graineterie du Marché (8 place Aligre). This tiny shop is lined with bin upon bin of dried grains, beans, flours and fruit. Bulk herbs and spices complete this cabinet of curiosities, where hard-to-locate fèves and farines find a home. In addition to the exciting food selection, La Graineterie also sells a wide range of products for the home. From practical accessories- sponges, soaps, and dishtowels- to unique finds such as vintage cookware and eclectic collections of flatware to handy - and handcrafted- market baskets and bags. Stores like La Graineterie, kept by friendly shop owners who offer a unique service to the community, are reasons why Parisians get so attached to their neighborhoods. I could imagine the simple joy that would be coming home from work on a cold winter day and popping into La Graineterie du Marché for a handful of dried peaches- just the right out-of-season treat to warm you up and encourage you to get through those dark, dreary Paris nights. More stops to nearby shops further confirmed the charm of the Marché d'Aligre neighborhood. We enjoyed a pastéis de nata and bought amazing olive oil at the Portuguese specialty shop Ma Petite Epicerie (18 rue d'Aligre) which was followed by an impassioned cheese chat at the fromagerie L'Alpage (15 rue d'Aligre). We couldn't help but stop at Les Chocolats d'Aligre (13 rue d'Aligre) which is stocked with chocolates made by some of the most celebrated chocolatiers in France. After our market visit, while enjoying glasses of natural wine at Le Siffleur des Ballons, I thought about me and Terresa's gourmet day and how happy a great Paris neighborhood makes me. Something about neighbors working and shopping together, taking time to share their passions for their country's greatest products, or specialty ingredients assembled as a means of sharing culture- this is what makes markets the precious gems of a community. Happy and well-fed, I felt satisfied in finally understanding what makes the Marché d'Aligre so special.